The name "Emperor Jimmu" is treated as the posthumous name of this mythical figure. In fact, being Chinese in form and Buddhist in implication, it must have been awarded centuries after the lifetime ascribed to him, as part of the compilation of legends about the origins of the Yamato dynasty known as the Kojiki. "Jimmu" literally means "divine might." The Japanese tradition of respect, even of reverence, for the Emperor could lead to excesses, as it did during World War II when obedience to the emperor and the claim that he was divine was used to prosecute the war. On the other hand, the myth of origin has also had a stabilizing effect, ensuring that ancient traditions such as respect for ancestors, for the land itself, and loyalty to the people of the nation, have survived through into modern times. According to Shinto belief, Jimmu is regarded as a direct descendant of the sun goddess, Amaterasu. Amaterasu had a son called Ame no Oshihomimi no Mikoto and through him a grandson named Ninigi-no-Mikoto. She sent her grandson to the Japanese islands where he eventually married Princess Konohana-Sakuya. Among their three sons was Hikohohodemi no Mikoto, also called Yamasachi-hiko, who married Princess Toyotama. She was the daughter of Owatatsumi, the Japanese sea god and brother of Amaterasu. They had a single son called Hikonagisa Takeugaya Fukiaezu no Mikoto. The boy was abandoned by his parents at birth and consequently raised by Princess Tamayori, his mother's younger sister. They eventually married and had a total of four sons. The last of them became Emperor Jimmu. Amaterasu is credited with bringing order to Japan after its creation as a result of the cosmic union of male and female kami, or great spirits. Establishment of the imperial system is thus also linked with the concept of order. The universe, in Shinto thought, is in a constant state of progress away from chaos towards order. Order, and progress, can be aided by the cooperation of people with good Kami against evil kami who intrude from outside. Obedience to or at least reverence for the Emperor would become an essential aspect of this worldview. So would reverence for ancestors, for tradition, for family, love of nature and a deep sense of loyalty to the people of the nation, who are "one big family." Great Japan is the divine land. The heavenly progenitor founded it, and the sun goddess bequeathed it to her descendants to rule eternally. Only in our country is this true; there are no similar examples in other nations. This is why our country is called the divine land. New Year's Day in the Japanese lunisolar calendar was traditionally celebrated as the regnal day of Emperor Jimmu. In 1872, the Meiji government proclaimed February 11, 660 B.C.E. in the Gregorian calendar the foundation day of Japan. This mythical date was commemorated in the holiday Kigensetsu ("Era Day") from 1872 to 1948, which was resurrected in 1966 as the national holiday Kenkoku Kinen no hi ("National Foundation Day"). Ancient texts speak of the relationship between emperor and people as that of "a big family," pointing out that in other nations the people come first and elect or choose a ruler, whereas in Japan the emperor was first. Although the divinity of the emperor was repudiated at the end of World War II, "the patriotism and love of country is still there" and "love of country" and "the commitment to community" all have "theological origins." Since the land itself is of divine origin, nature and its health and preservation, are also of central concern. Buddhism entered Japan from China via Korea in 520 C.E. Although it did not enjoy official state patronage until 1638 (until 1867) it always appealed to the Emperors, whose authority could be challenged by local Daimyo (great names, feudal rulers) who could claim to be Kami. 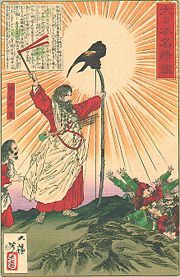 By identifying themselves with a superior type of Kami, who in Buddhist terms was regarded as a Bodhisattva more powerful than other Kami, the Emperor increased his mystique and claim to be unique. After 1867, it became illegal for anyone to identify Kami as Bodhisattvas. The word Shinto, which can be translated as "the way," or "the essence" was not used until after Buddhism entered Japan. Whether myth, or based on a real early or even first ruler of Japan, Jimmu has an honored place in Japanese tradition. The idea of a special bond between ruler, land and people helped to make governance more stable. During the periods of military rule, when Shoguns exercised power, the Emperor was still revered and remained, at least theoretically, the sovereign. Such was the respect for the institution which, according to the myth of origin, began with Jimmu, that overturning this was unthinkable. ↑ Richard Overy, The Jinno Shotoki, The Complete History of the World (NY: Barnes & Noble), 136. ↑ Ian A. Markham, World Religions Reader, 2nd ed., (Oxford: Blackwell, 2000 ISBN 9780631215189), 205. Citing D.C. Holton, The National Faith of Japan, (London: Kegan Paul, Trench, Trubner & Co, 1938), 129-32. History of "Jimmu, Emperor of Japan"
This page was last modified on 10 May 2014, at 15:44.